We are done with the study of banking operations. The next step is to incorporate them into the analysis of macroeconomic issues and this post begins on such topic by focusing on inflation. When inflation is mentioned, it is usually in relation to the cost of buying newly produced goods and services for consumption purpose. Another type of inflation concerns asset prices, i.e. the price of non-producible commodities and old producible commodities. This post does not study asset-price inflation, which concerns theories of interest rate. There are two broad ways to categorize existing explanations of inflation (and deflation); monetary explanations and real explanations (“real” means related to production). Below are two popular theories based on such categorization. H3: Q is constant at its full employment level (Qfe) or grows at its constant “natural” rate (gQfe). Supply conditions (productive capacities) are supposed to be independent from the demand conditions (spending on goods and services). 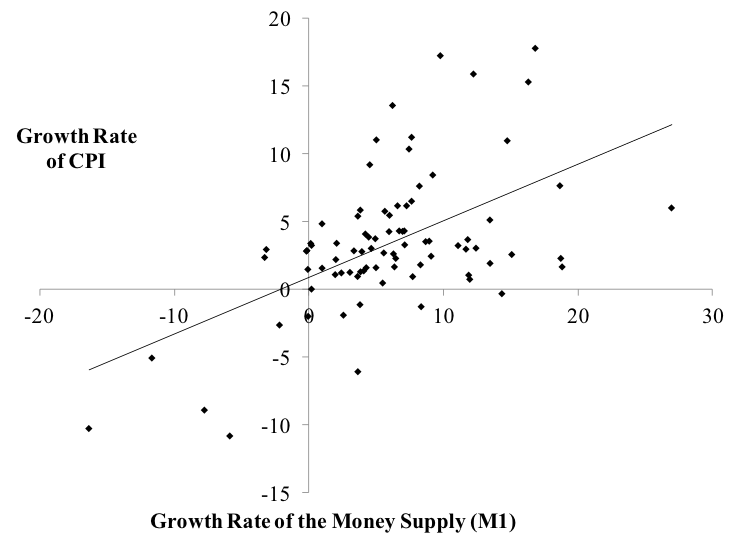 If the money supply grows faster than the natural rate of economic growth, there is some inflation (gP > 0). If gM = 2% and gQfe = 1% then gP = 1%. If the central bank increases the growth rate of the money supply, inflation rises by the same percentage points while the growth rate of production is unchanged. Inflation has monetary origins. The economic logic is the following in terms of price level. First, suppose some money falls into the hands of economic units. How? Milton Friedman is famous for arguing that economists do not need to care about how the money supply enters the economy; one can merely assumes that it falls from a helicopter. Following H1, one may say that the central bank injects reserves, which leads to a large increase in the amount of bank credit. So now economic units have a bunch more monetary instruments. They could save them but H2 implies that economic units have hoarded everything they wanted to hoard so economic units rush to stores to spend. Given that the economy is at full employment, the only way the economic system can adjust to the large increase in the demand for goods and services is through an increase in prices. Money is “neutral,” it does not impact production. The main policy implication is that central banks are best suited to tackle inflationary problems, while productive issues are best left to relative price adjustments via market mechanisms. The central bank can manage output prices by targeting the quantity (growth rate) of reserves and by setting the reserve requirement ratio. This will constrain the quantity (growth rate) of money supply and set a specific price level (inflation). Controlling inflation is an easy job, a central bank just needs to decide what its inflation target is (gPT) and to determine what the natural growth rate of the economy is (gQfe). If, for example, a central bank has an inflation target of gPT = 2% and the natural growth rate of the economy is gQfe = 3%, the growth rate of the money supply should be gM = 5%. Assuming a stable multiplier, this means that the growth rate of reserves should be 5%. If gM > gM*, a central bank is too lax (i.e., its interest rate target should be higher) and inflation will be above target in the medium term. The money supply is not controlled in anyways by the central bank. Not only does the money multiplier theory not apply, but also the growth of the money supply is driven primarily by the demand for bank credit by private economic units (banks cannot force feed credit to economic units) and by government spending and taxing. Interest-rate targeting has only a remote and uncertain effect on the growth of the money supply, even more so on inflation. The economy is rarely at full employment so if the demand for goods and services increases the supply of goods and services increases. 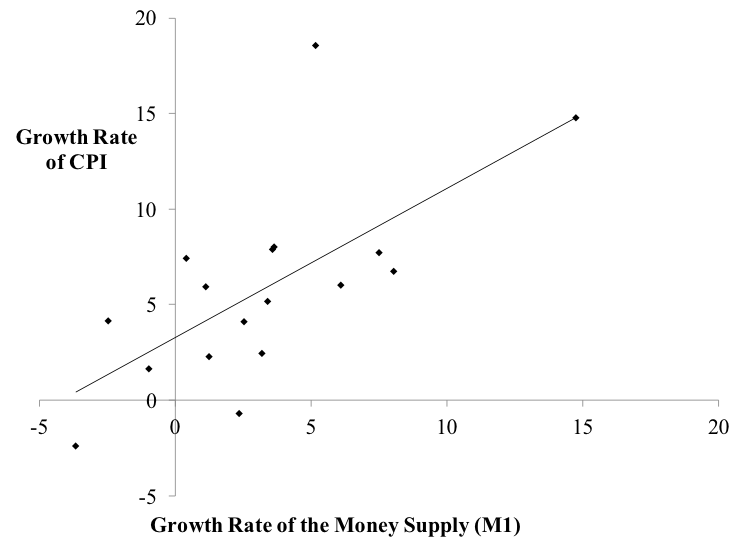 In terms of basic empirical evidence, the strong correlation between money supply and price that one should expect does not exist even in the long-run (Figures 1 and 2). While correlation improves as the length of time increases (one-year correlation is 0.55, five-year correlation is 0.67, ten-year correlation is 0.71), the correlation is weaker than what the theory suggests. The fact that inflation and money supply growth are positively correlated does not tell us the direction of causality. One may doubt that the causality goes from M to P given the strong assumptions required for that to be the case. The next section will develop this point. H1: the economy is usually not at full employment and Q (and economic growth) changes in function of expected aggregate demand (this is Keynes’s theory of effective demand). H4: APL moves in function of the needs of the economy and the state of the economy, it is procyclical to the state of aggregate demand for goods and services. In general, in periods of labor-time scarcity gAPL goes up and, during an economic slowdown, gAPL goes down before employees are laid off. Cost-push inflation: the growth rate of the unit labor cost of labor (gw – gAPL) depends on how fast nominal wage grows on average relative to the growth rate of the average productivity of labor. 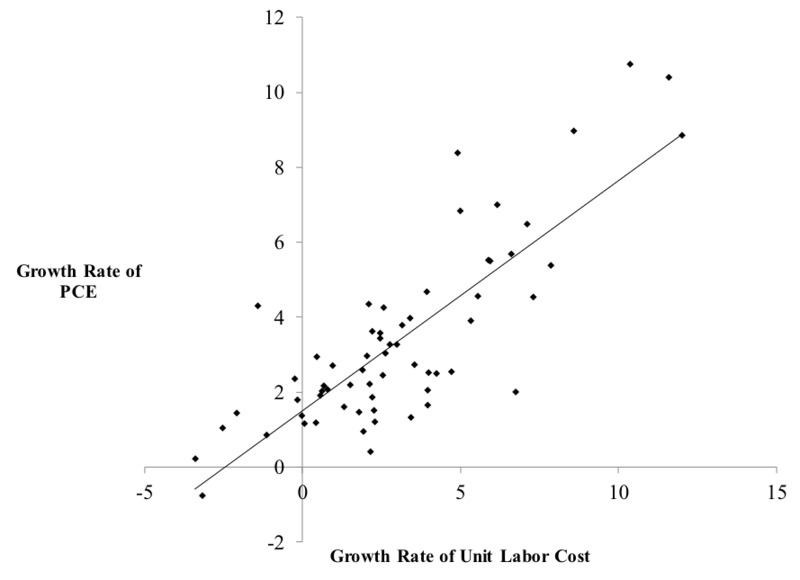 The correlation between the unit cost of labor and inflation is very strong both in the “short-run” (0.82 for yearly growth rates) and “long-run” (0.93 for five-year growth rates) (Figure 3). Note that the money supply is absent from this equation. The money supply does not directly affect output prices. Spending may impact inflation but it depends on the state of the economy. Note that the growth rate of wage is by itself not as relevant. It is its relation to the growth rate of the average productivity of labor that matters. Time-series data provides another insight into the role of the unit cost of labor (Figure 4). From the mid 1960s to the early 1980s, unit cost of labor was a main source of high inflation. Nominal wage growth outpaced productivity growth, both grew on average. The former was in the 5-10% range whereas the latter was mostly in the 0-5% range. In the late 1960s, workers were able to outpace productivity growth because of their strength in wage bargaining due to low unemployment and strong unions. The 1970s oil shocks boosted inflation and workers tried to maintain their real wage (they failed) by demanding an increase in nominal wages. This further reinforced inflation because productivity could not keep up with wage demands. 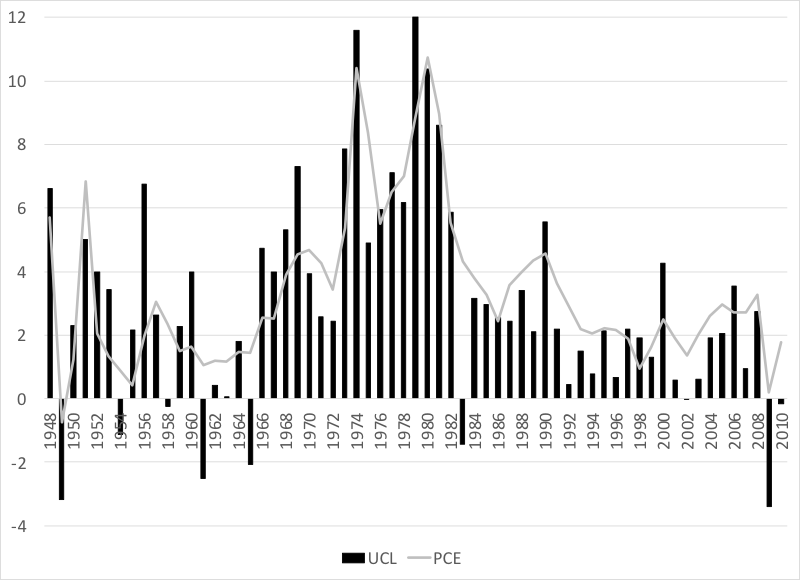 The internationalization of labor and the decline in the power of unions have tamed the ability of wages to outpace productivity even in periods of long economic growth. When combined with the explanation of monetary creation presented in Post 10, this theory of inflation provides an explanation of the correlation between price and money supply that involves a reversed causality compared to the QTM. Higher costs of production and higher demand pressures push up the price of goods and services, which increases the size of the bank advances that economic units request: higher P (gP) leads to higher M (gM). Federal government spending (that injects money supply) and taxing (that destroys money supply) move automatically in a countercyclical fashion to tame inflationary pressures (“automatic stabilizers”): during an expansion (a recession), the growth rate of government spending falls (rises) and the growth rate of taxes rise (falls). 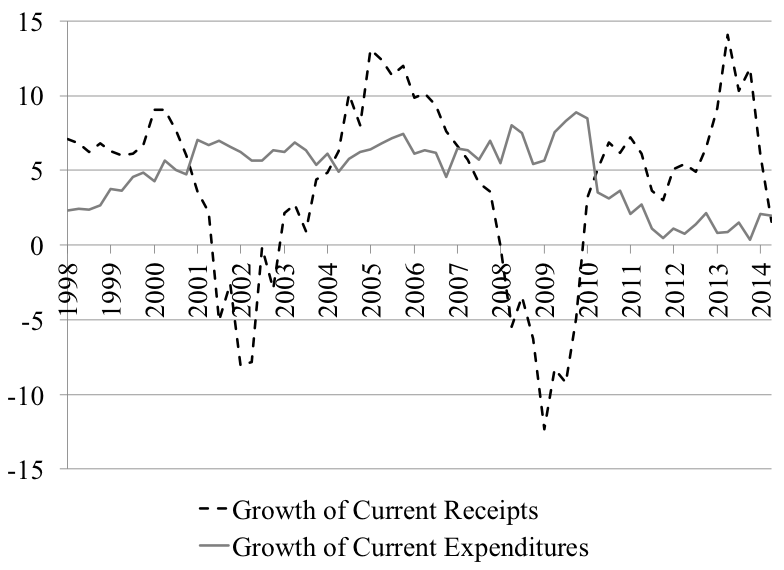 In the US, most of the automatic stabilizer effect comes from wild fluctuations in the growth rate of taxes (in a recession economic units have less income so they are taxed less) (Figure 5). So the money supply is not something that falls from the sky, its injection and destruction in relation to the production process must be explained and the debts incurred by monetary creation must be included in the analysis. If the economy is growing, money supply grows, if economic units do not want to hold monetary instruments they may just use them accelerate the repayment of their bank debts. In terms of policy, the theory means that inflation is managed best by buffer-stock policies and income policies, or a combination of both such as a job-guarantee program. Monetary policy does not have much direct impact on inflation, and an increase in interest rates can contribute to inflation through the cost and demand impacts of higher interest rates (see below). The role of a central bank is to preserve financial stability through the provision of a stable low cost refinancing source and through regulation. The assumptions are that gw results from a bargaining process between employees and firms. gZ depends on monetary policy and the state of liquidity preference (Z depends on the level and structure of interest rates). gAPL is procyclical to the state of the economy. gQ is determined by expectations of monetary profits (Keynes’s effective demand). As shown below, gUnD is determined by the Kalecki equation of monetary profit. Finally, the growth of profit taxes depends on the tax structure and economic activity. For the sake of the argument, one can assume that national income shares are constant and sum to one (sW + sZ + sUnD + sTu = 1). Inflation can go up and down as gUnD, gw, gZ and gTu go up and down, but their effects will be mitigated by changes in productivity growth and output growth. Only when the latter two are fixed or sluggish relative to the former four can inflation permanently take place; this is a state of “true inflation” to take Keynes’s terminology. One economic condition during which this can occur is full employment, but this is not the only one. Prices may go up quickly because of, for example, uncontrolled wage-price spiral induced by high expectation of inflation, competition between unions for relative wage improvements, or a rise in costs not controlled by residents (e.g., oil shock). Rising interest rates also can promote inflation by raising costs of production (Post 5 noted that FOMC members are aware of this inflationary channel). This explanation of inflation does not discard the possibility of a monetary source of inflation, but it requires that several conditions be met because the relation between money supply and inflation is highly indirect. First, if funds are injected via portfolio transactions (swapping of non-monetary assets for monetary assets), output-price inflation may occur only if desired stocks of monetary assets are fulfilled. If receivers of monetary assets decide to spend their excess funds to buy existing goods and services—they could also buy financial assets, which would lower interest rates, and/or repay their debts—and if the economy is in a sluggish state. Where si is the share of variable i in national income (or GDP) which is assumed to be constant. As the economy gets to full employment, any type of spending (public or private, consumption or investment) will tend to be inflationary. Higher interest rates can contribute to demand-pull inflation if the growth of consumption by rentiers increases too fast as a result of higher interest income. The inflationary tendencies can be mitigated by the growth rate of tax, the growth rate of production, the growth rate of the average productivity of labor and the growth rate of saving. This entry was posted in Eric Tymoigne and tagged money and banking. Bookmark the permalink. There is one thing missing from all the above analysis on inflation – time. For there to be price inflation in anything there has to be two things competing to do something *at the same time*. Price then determines which project is delayed or scrapped. So the other way to attack inflation is to use powers to serialise things in time so there are no competing demands on resources. The classic one is planning where you can require the school to be built before the casino, and the other is to set a fixed price on a job below the ‘market’ rate that only gets picked up when the market demand drops (a limit order if you like). The Job Guarantee is of course a limit order on employment. Very nicely laid out! Nice to have such a formal and relatively easy to understand justification for a job-guarantee program. Velocity and circulation of money are two different economic mechanisms. Circulation of money means journey of money. It starts when it is borrowed from a bank and ends when it is paid back to a bank. Velocity of money means locations on which the money has visited during its journey. A tax collector, bakery, pay check and so on. So, the velocity of money (how much one can spend) depends on circulation of money (how much is borrowed and paid back). There are at least three ways to calculate GDP. Income approarch is one of them. What ever calculation method is used, one problem remains: how to clean GDP data from transactions where same dollar is used over and over again. If GDP data is not cleaned from these kinds of transactions, the calculations automatically assumes that velocity (or circulation) of money can not affect prices. In the equation M means money supply and V means velocity of money. Money supply is calculated at moment, but velocity is calculated by as time passes. This means that two essentially different numbers are calculated together and any number we get out from the equation is wrong. This is a comment on part Part 10, but I have to post it here because comments on that part are off. 1) When banks acquire a previously existing real or financial asset (say, a building or a share) do they also do it by expanding their balance sheet, creating new deposits (“money”) for the seller of the asset in the process? 2) Can banks increase their capital by granting a loan to a third party and then convert the deposit thus created (a liability) into equity?. Something like this apparently did take place in the case of Credit Suisse in 2008 – it lent SFr 10 billion to Gulf investors and then converted the deposit into preference shares (which served as collateral in this operation) thus boosting the bank’s capital/asset ratio by creating its own capital out of thin air (see http://www.ft.com/intl/cms/s/0/d96d1444-6c97-11e2-b73a-00144feab49a.html#axzz459T7gcB0 ). Do you think that such an operation would be feasible in the U.S. ? Q2) In normal times anything can happen, creditors just have to agree to change the terms of the promise they hold against a bank. Converting deposits into preferred shares entails risks and so account holders may not agree to do the conversion. In times of crisis, when capital base is weak, regulators may ask for conversion of some liabilities into capital. When looking at money circulation it is important to accept that there are a fair number of different circuits that the money-flows take. (Actually I reckon there are 46 in my model, but others will presumably simplify it more and have fewer.) The rate of flow or velocity of each circuit is different, which complicates the way that one might choose to add them together. This is because when we try to find the total rate by addition we must not add each one more than once. This is difficult if not impossible when considering each circuit independently and then to take their direct combination, and another method is needed. For each entity or role-playing agent, the total money flowing in, which is mostly equal to the total amount flowing out (using Leontiff’s INPUT/OUTPUT method), will enable this total to be reached without the need to study and include each circuit itself, no matter how many or few of them there are.